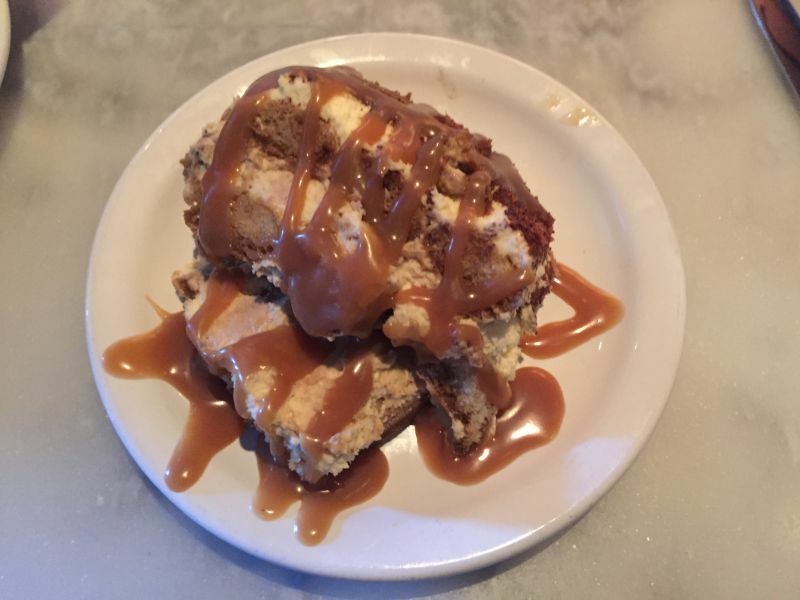 A couple of friends and I recently visited Lucca Bar and Grill in Benicia. We went there based on a recommendation given to one of those friends. Lucca sits on 1st Street on the opposite side of the street to our other Benecia favourites, The Loft and Aroma. Lucca offers a small dining room, a bar, outside seating, and a large beer garden. There is an extensive range of beers, some intriguing cocktail options, and a varied selection of wines; with many available by the glass. The restaurant offers half-price bottles if you spend $15 or more on food. If I had been visiting with people who shared a similar taste in wine, this would be an excellent option; especially as the wine prices are fairly reasonable at full price. 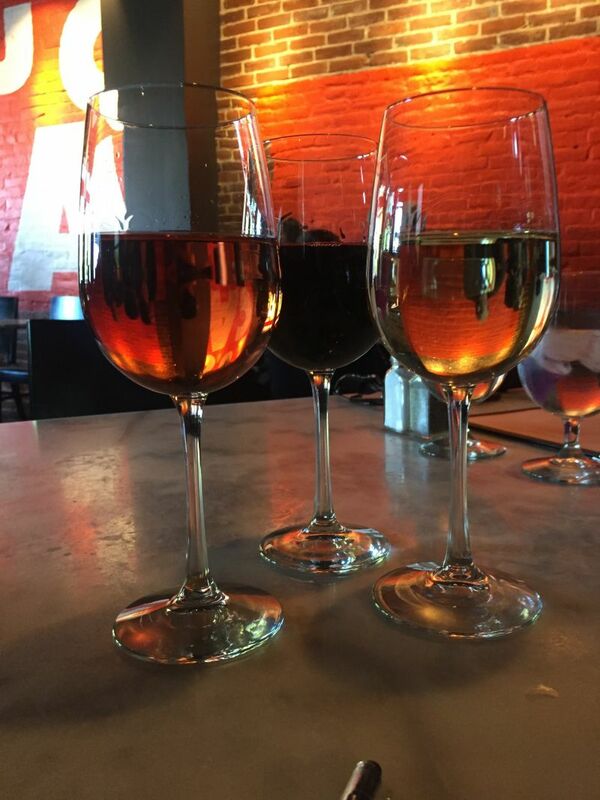 We ordered three glasses of wine: a white Zinfandel, a Pinot Gris, and a Petite Sirah; that should give an indication of how tricky it would have been to find a bottle to share. The decor is simple; bare brick walls and floor boards. The restaurant was busy, but not packed, on a late Sunday afternoon seating. Whilst the decor might suggest that conversations would reverberate, the sound levels were low and we could talk and hear each other at normal volume. These were the same two friends with whom I visited Va De Vi a few weeks ago. They went with the Brussel sprouts again as a starter. The sprouts were served with yellow curry salt and lemon. My friend had heard a rave about this dish, but they both agreed that this deep-fried variation on the dish did not compare well to that from Va De Vi. 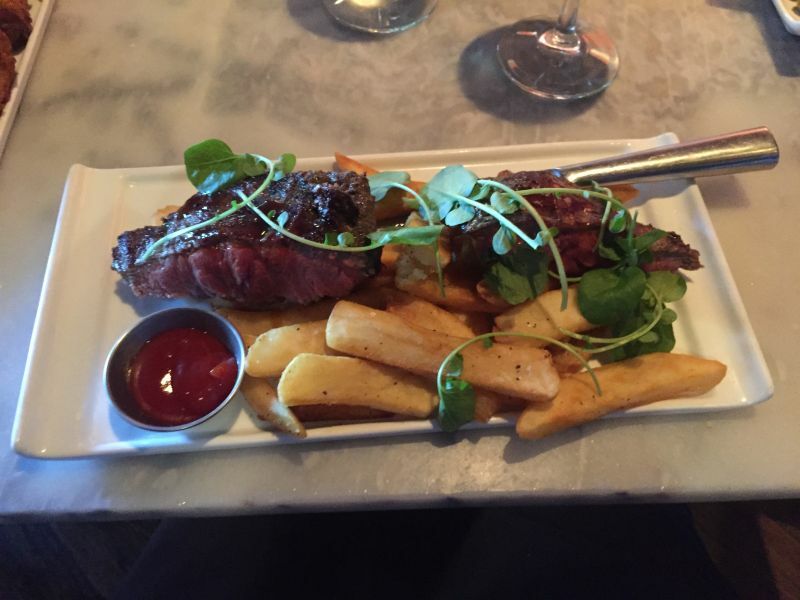 I ordered the steak and fries served rare; as this picture shows, the meat was cooked just as I had asked. The fries were properly chipped potatoes and not the skinny fries that one sees so often. The portion was generous, possibly too large. The steak was cooked correctly and the meat was flavourful, but I would have preferred it to have a little more seasoning. Despite those concerns about the seasoning and the size of the portion, I ate all of the meat. One of my friends had the fish and chips. You can see that this too was a large portion and she took one of the fish pieces home with her in a box. Ketchup, malt vinegar, tartar sauce, and coleslaw were all served in small pots. Three of these four belong with fish. 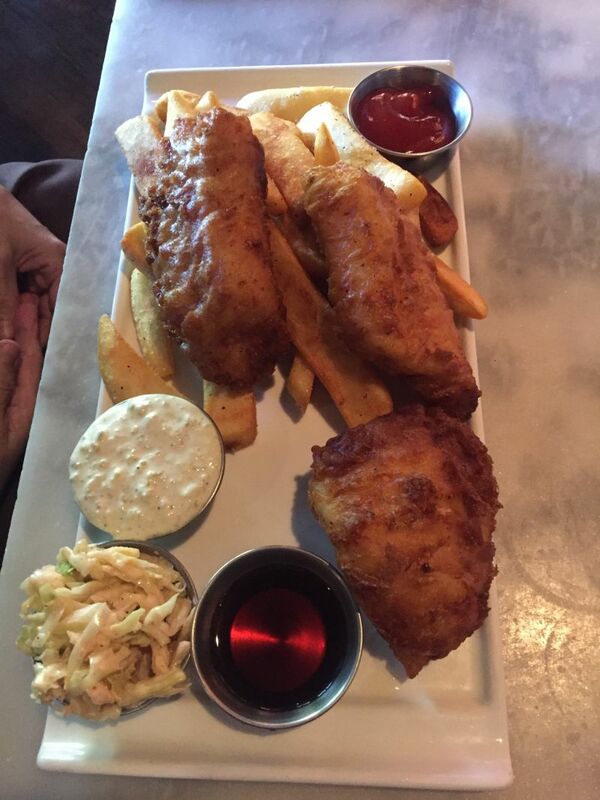 I do not understand the presence of coleslaw with fish and chips; one of those occasional reminders that Americans do not truly understand English cuisine. The fish was flaky and perfectly cooked. I was not impressed with the batter, which was neither crisp enough nor possessing enough seasoning. My other friend ordered a pork chop; this proved to be an excellent choice. The meat was juicy and flavourful. It was topped with an apple chutney that was seasoned to perfection with cinnamon. The carrots were crisp, providing a good textural contrast to the pork. This was the best of the three main courses. The large portions were almost enough to discourage us from ordering dessert, but common sense lost out to a magic word: tiramisu. I was surprised to see that butterscotch was drizzled over the dish, but this variation worked well. The dessert was light, with the layers combined well. I would prefer a more distinct coffee taste, but at least one of my friends was grateful that this element of the flavour was in the background. 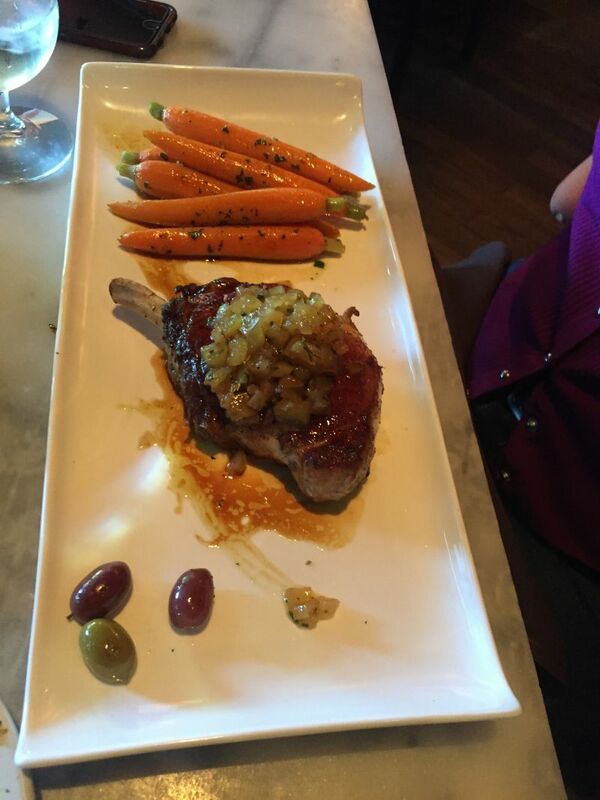 Overall, there were no outstanding dishes, although the pork chop came close. The service and atmosphere were good. Lucca offers a range of Happy Hour offerings from 3pm to 6pm on weekdays. We enjoyed ourselves enough that we will be trying one of these events in the near future.